I’ve done some rework on the front page, mostly updating the layout to take advantage of Twitter’s bootstrap. I also finally have a suitable photo for arachnolingua branding. 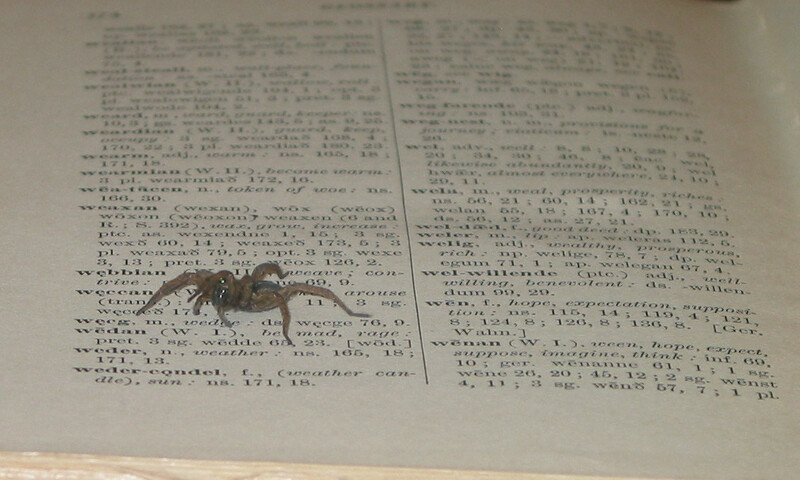 You can see a minimized image at the upper left of the front page, and here is a larger image showing one of my resident spiders on the open pages of the glossary from the 1917 editor of Bright’s Anglo-Saxon Reader. The spider is standing over the Anglo-Saxon for both ‘weave’ and ‘grow’, which are a pretty good compromise for not having ‘spider’ in the glossary.